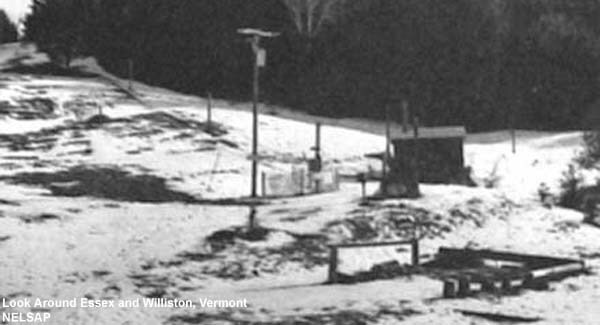 Located off Chapman Lane in Williston (east of Burlington, Vermont), Williston Ski Associates' Chapman Hill is a small, private ski area. Lift served skiing on Chapman Hill likely dates back to the 1960-61 season, when Williston residents Howard Carpenter and Arthur Tuthill obtained permission from Bob and Peg Chapman to install a rope tow on their hill. Williston Ski Associates, Inc. was incorporated following the 1970-71 season. Chapman Hill ski area remains in operation when natural snow allows as a private club facility. The club reportedly has a 25 member limit. "I have great memories of helping my father and older brother in building the tow and clearing slopes in the early 60s. Power for the original rope tow was supplied by an old Chevy mounted on blocks at the top of the hill. The tow itself was in two stages, changing direction by perhaps 40 degrees midway. A rider would get off, walk a few yards around the pole where the sheaves were mounted, and grab the rope again to get to the top. The return for the rope came straight back down the hill through the woods, completing the third side of a triangle. I don't think I've ever seen a design like that elsewhere." "Learned how to ski at Chapman's in the early/mid-70s. Whoever showed up first had to start the engine. Thermos of hot chocolate was a must. Great glades skiing (for a 6yo)." "Skied there with the family throughout the 70's when I was age 5-13. Remember sipping hot cocoa around the fire pit, warming our frozen toes, after making many runs through the 'Grandfather Trail' with friends and my brothers. Classic!" "We were so excited to see this great family area still exists. We were very involved while our boys were growing up in Williston (1972-85). We also cross-country skied at Tuthills and McCollaughs (not sure of spelling there). Great area to bring up kids!!" "Had my first lesson there at age 6"